Love is never enough to make a relationship. And one other huge mistake you are making..
Love is never enough and yet that is what most of us base our primary relationship on! LOVE alone. Oh I know what you are saying, not me Steve. I want much more and I look for much more. Really? Ok, here is your test, pull out your note, message, list, goals for at least ten things other than love that you are looking for. Yes, take it out of your wallet, your purse, your desk drawer. Pull it off of your fridge or wherever you are keeping it. Oh, you don’t have it? Ok, then right now, right here, while you are reading this, write down those things. Yes, right now write them down. You do know them correct? Nope. Not going to let you get by with that. NO! When we say love is never enough and that most people make their choices based on their emotions, based upon that wonderful euphoric feeling called love. That thing that distracts you and blinds you and allows you to look right past some of the most horrible obvious things that tell your friends, danger Will Robinson! Danger! You see if you allow your ego and your stubbornness to keep you from writing down the things you really want in your next partner you are making your second huge mistake. Write down specific things. I don’t just want someone who will treat me right, by right I mean … and then describe in detail what you mean. Describe each generic goal in specifics. I want someone who will love me.. what does love mean to you? Is it hugging? Kissing? Is it being supportive or being strong with you? Is it sharing quality time and being close? What does ‘love me’ mean? If you have those things written down they will be more concrete in your mind. They will rise to the surface and remind you when that someone you love might be great to love but horrible to be friends with. Terrible to spend hours, days and years with. So now that you have a clue. Get started. Start writing and don’t stop until you have a whole bunch of specific things you want and don’t want in your next partner. And that is the one step of many to your finding the love of your life. Want more tips? Subscribe to my podcasts. 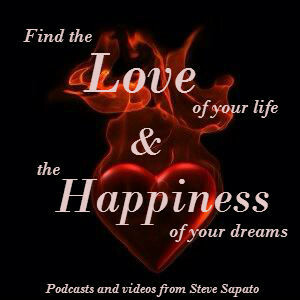 Go to www.stevesapato.com and click on the newsletter sign up to receive news each time I post a new podcast and one newsletter ever two weeks to help you discover some secrets to LOVE.